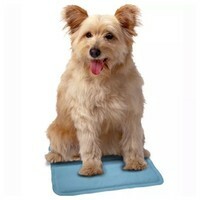 Snugglesafe Instant Cool Pad is the perfect solution for animals that feel the heat. Designed to automatically cool down when an animal lies on it, the Snugglesafe Cool Pad will reduce temperature within moments and will last for several hours at a time. Perfect for use indoors, outdoors and travelling, the pads do not require any electricity and therefore also have no wires or uncomfortable areas. Medium: 40cm x 30cm (15.7" x 11.8"
This is absolutely amazing - so much so that as the dog wasn't particularly interested, I borrowed it myself to keep cool in the heatwave. It also doubles as a pad under the laptop! Going to order another for the dog. My only slight grumble is that I wish a larger size were available.